Dio has been around for over three decades, and for good reason. His unquestionable legacy, both when solo and while singing with Black Sabbath and Rainbow, still holds up today as one of metal music's premiere singers. On the latest solo endeavor by the elfin singer, all of the devices which comprise a classic Dio track are here, from the dramatic keyboard instrumentations of "The Man Who Would Be King" to the snarling guitars that dominate "Death by Love" to the regal feel of the title track. 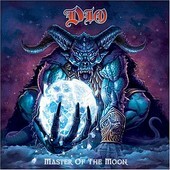 Old fans of the strong throated, fantasy-obsessed front man will not be disappointed, as the 10-track Master of the Moon contains all of the metallic majesty that can only be pulled off by a veritable metal veteran of this caliber who still, after all of these years, has the showmanship and vocal abilities of a man half his age. Long live rock 'n' roll, indeed.